Frank Hamrick: "I have found the handmade book to be a favorable alternative to the traditional method of exhibiting photographs on the wall. 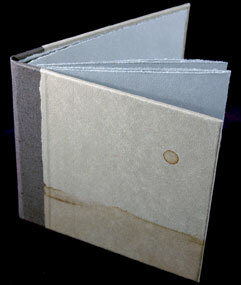 … The handmade book can convey ideas in ways other mediums cannot. The viewer has an intimate relationship with the book by holding it, feeling its textures and turning its pages, instead of just standing across the room staring at it. Additionally, the handmade book is its own piece of work and is not to be confused with a monograph, a book that often reproduces two or three-dimensional works of art that should be seen in person. 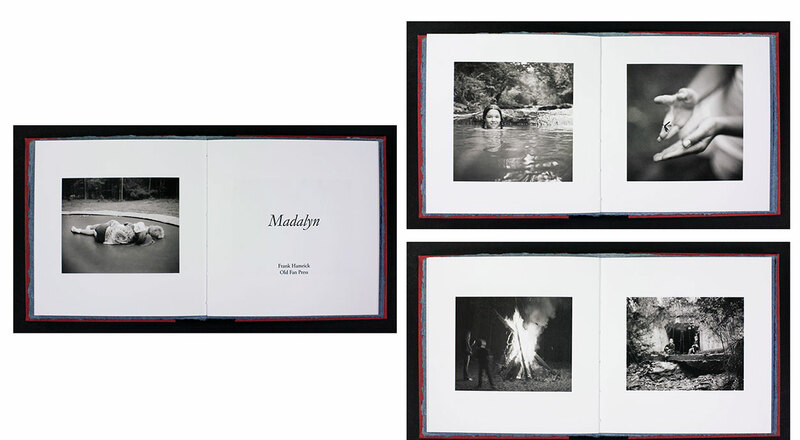 "If you were to think of a photograph in the same way you consider a single song, then a handmade book is similar to an entire album of music complete with cover art and liner notes. 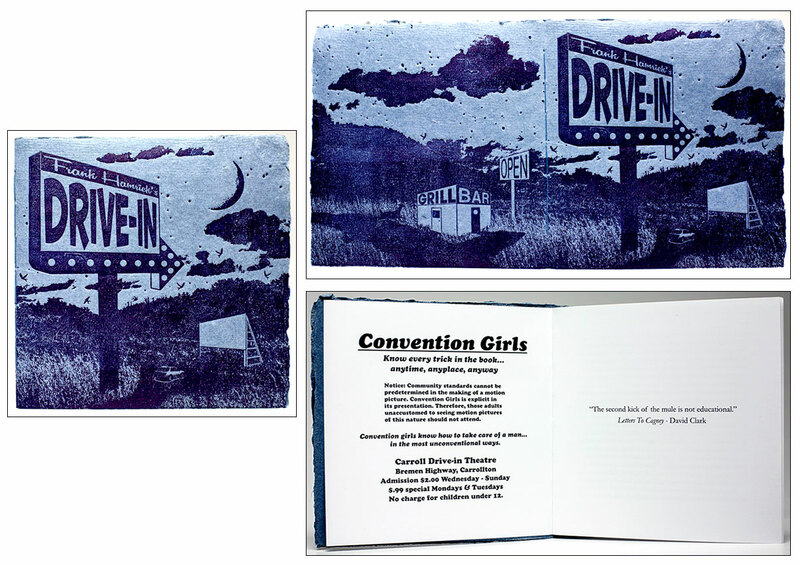 The handmade book allows me to combine imagery and text and incorporate materials, like handmade paper, and processes, such as staining and letterpress printing, to create unique or limited works of art." Ruston, Louisiana: Old Fan Press, 2017. Edition of 41. 7.5 x 3.75"; 20 pages. 18 illustrations (duotone, four color). Indigo digital printing process. Materials: Jade 711 PVA glue, 18/3 Irish linen thread; .08 Davey binder's board, cotton rag paper, 80 lb., uncoated, Mohawk paper. Signed by the artist. Edition number stamped onto the end sheet. Handbound pamphlet binding with quarter cloth and paper over boards. 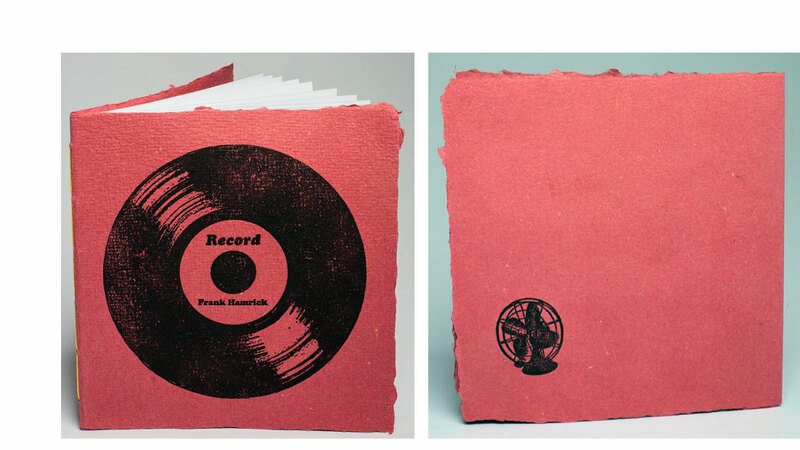 Cover art and title are letterpress printed on cotton rag paper handmade at the University of Georgia and its study abroad facility in Cortona, Italy. Frank Hamrick: "My face tastes like salt is an artist's book … featuring eighteen portraits, landscapes, and still life images originally created as 8 x 10" and 8 x 8" tintypes, which focus on looking at and moving through the natural world." 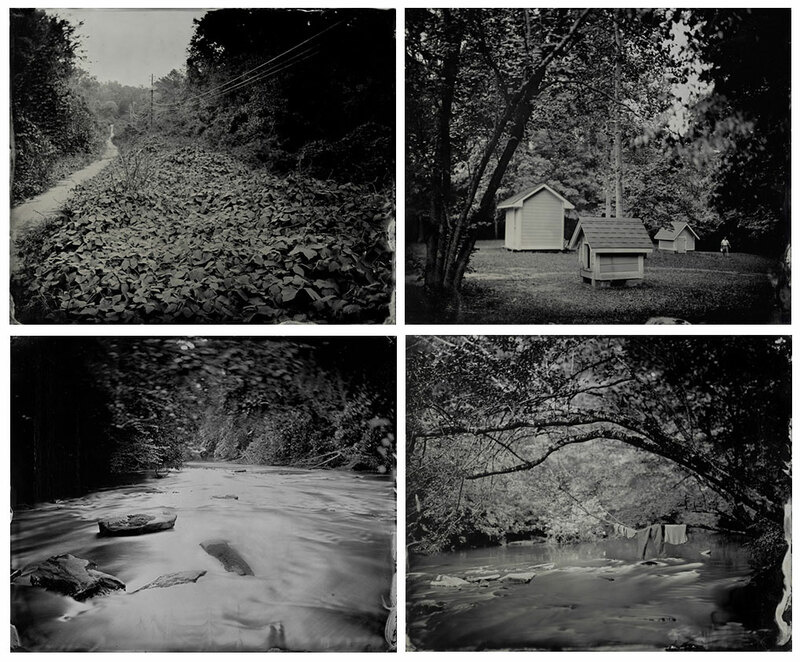 The images were created using wet plat collodion tintype photographs and are of scenes in Georgia, Louisiana, and Tennessee. Ruston, Louisiana: Old Fan Press, 2016. Edition of 35. 7.25 x 7.5"; 20 pages. 17 black-and-white photographs. Single signature. 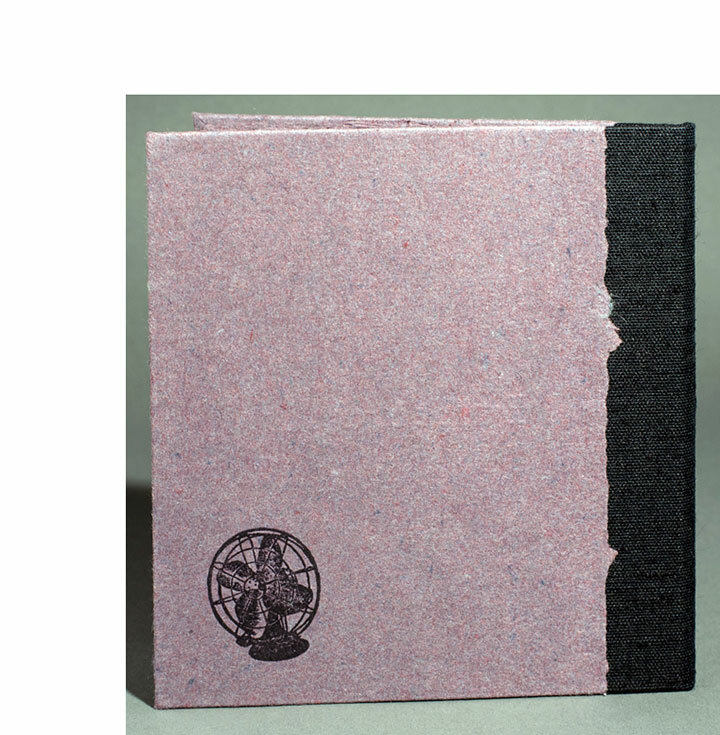 Hardcover pamphlet binding. Signed by the artist. 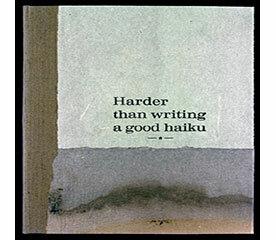 Frank Hamrick: "Harder than writing a good haiku features reproductions of seventeen tintype photographs created during travels through Florida, Georgia, Louisiana, and Tennessee. Each image initiates its own narrative that points in a particular direction but the story's ending is left to the viewer. "The title is letterpress printed onto handmade cotton rag cover paper, while the edition number is letterpress printed onto the cotton rag end sheet of each book. The tea stains on the cover are inspired by the hills of Whites Creek, Tennessee, and the fight to protect the area from Nashville's encroaching development." Ruston, Louisiana: Old Fan Press, 2015. Second Edition of 25. 6 x 6"; 20 pages. Printed on cotton rag paper handmade at the University of Georgia's study abroad facility in Cortona, Italy. LaserJet printed in Garamond on 50 lb., double-sided matte Red River Paper. 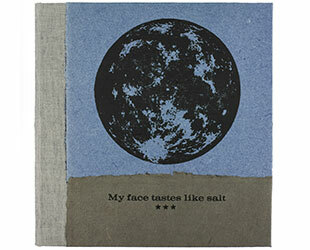 Cover art relief printed on blue handmade cotton rag. Pamphlet stitch bound. Signed by the author. Frank Hamrick: "Drive-in tells the story of growing up towards the end of the twentieth century before the reality of smartphones, social media, and 9/11. " Ruston, Louisiana: Old Fan Press, 2015. Edition of 25. 6.25 x 6.75"; 20 pages. Contains 18 black-and-white photographs. Inkjet printed on 50 lb. matte Red River paper. Letterpress printed cover art on cotton rag paper handmade at the University of Georgia's study abroad studios in Cortona, Italy. Bound in paper-covered boards with cloth spine. Signed by the artist on the colophon. Frank Hamrick: "My niece, Madalyn, and her brother, Copeland, explore Georgia with me, canoeing the Ocmulgee, crossing the rocks below the dam at Juliette to discover an island full of goats. Upstream from the Indian mounds a cottonmouth reroutes us to an arrowhead washed ashore. Madalyn, barefoot and without her license, drives her great-grandfather’s truck as I sit in the back holding the boat. We pick blackberries and find Elizabeth Reed’s grave after lunch at the H&H. Madalyn will now attend college on Coleman Hill. Money from the sale of this book goes towards her tuition." Ruston, Louisiana: Old Fan Press, 2014. Edition of 35. 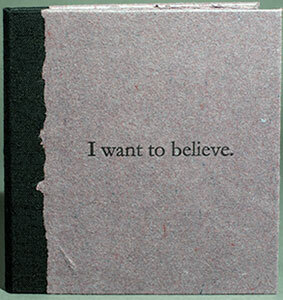 6 x 6.25"; 20 pages. LaserJet printed text in Garamond on 50 lb. matte Red River Paper. Materials: handmade cotton rag paper, ink, Irish linen thread. Cotton rag covers. 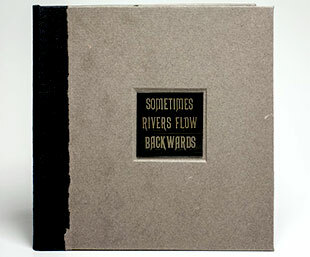 Letterpress printed cover art using a polymer plate from Boxcar Press. Titling in Cooper Standard. 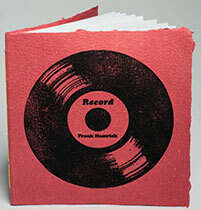 Frank Hamrick: "Record is a 20 page book containing 13 short stories. Music is central to the theme of each piece of writing. ... The cotton rag covers were handmade at the University of Georgia's study abroad facility in Cortona." Ruston, Louisiana: Old Fan Press, 2014. Edition of 25. 7.25 x 7.5"; 14 pages. Interior pages inkjet printed. LaserJet printed colophon. Printed on 50 lb. double-sided, matte, Red River Paper. 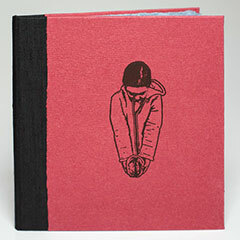 Bound in paper-covered boards with Canapetta bookcloth spine. Paper for boards and endsheets handmade from cotton rag. Signed and numbered on the colophon. 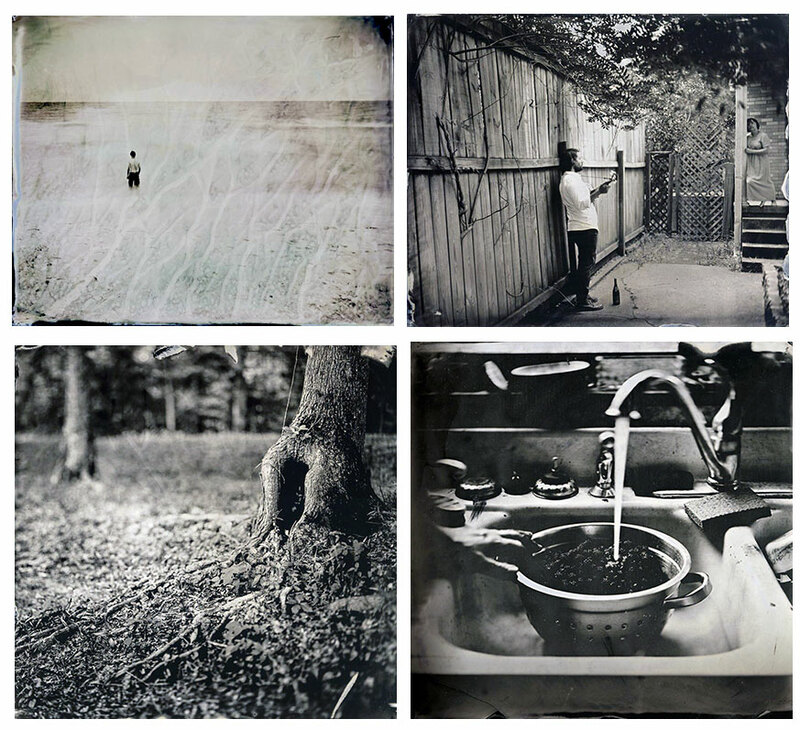 Images by Frank Hamrick using tintype photography. Colophon: "Natural disasters such as floods, hurricanes, and earthquakes can cause rivers to reverse. Letterpress type is inversely carved so that words read properly when inked and pressed onto paper. Tintypes capture mirror images of their subjects. Just like multiplying two negatives results in a positive, making a wet plate of letterpress characters produced the cover's right reading inset tintype." Frank Hamrick, Light Leaked interview: "Digital photography has made things more accessible to people but also leaves many feeling removed from the process. These hands on, alternative methods being practiced can be seen as a reaction to the proliferation of digital processes, but there are also a lot of analog/digital hybrid processes being developed. 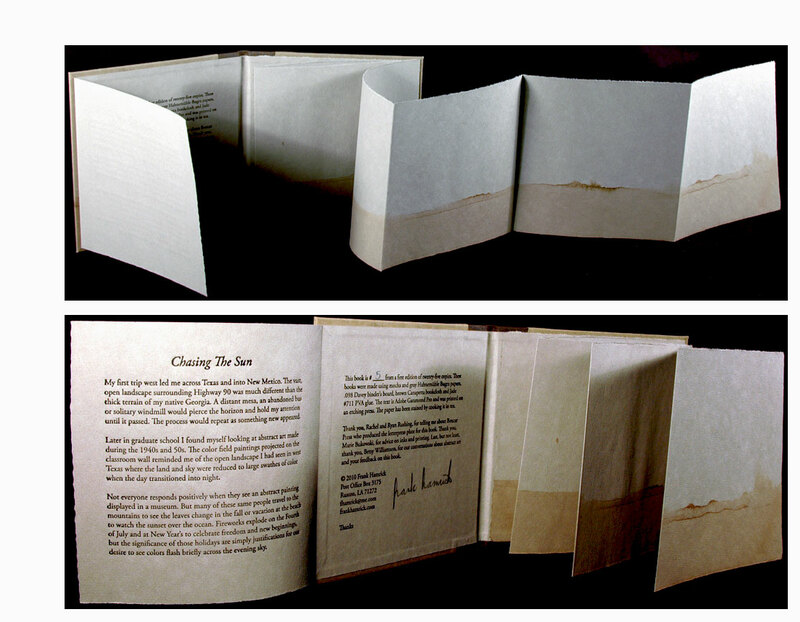 "My bookmaking is a good example of blending analog and digital methods. 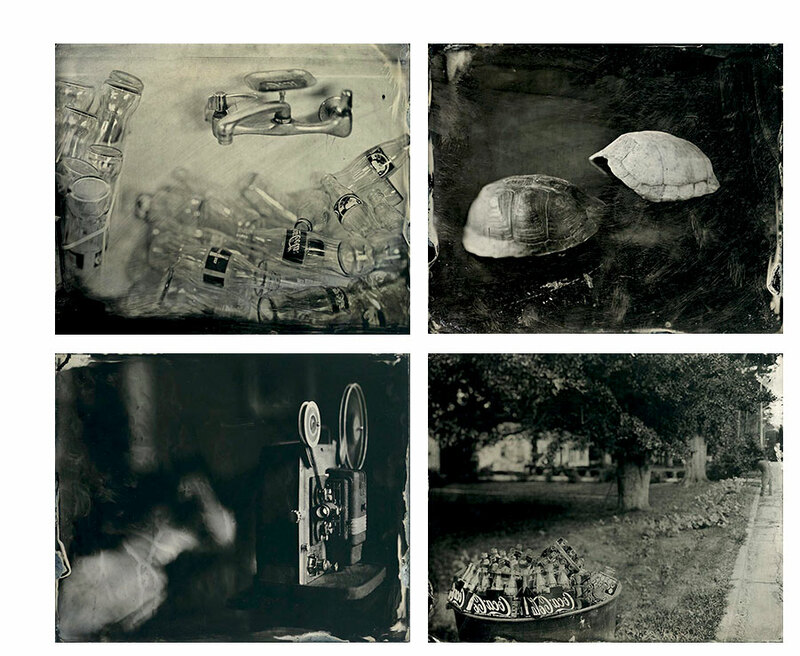 "A few years ago one of my graduate students had been unsuccessfully trying to learn how to make tintypes. I did not know how to guide him. My solution was to start learning the process over winter break and then return to school and show him." Ruston, Louisiana: Old Fan Press, 2013. Hardcover edition of 25. 6.25" x 6.25"; 20 pages. Pamphlet binding. LaserJet printed on 50lb., double-sided, matte Red River Paper. Garamond typeface. Bound in quarter cloth. Paper covered boards of handmade cotton rag paper printed on an etching press using a polymer plate from Boxcar Press in Syracuse, New York. Signed and numbered by the artist on the colophon. Some stories were previously published in the one-of-a-kind books Hideaway, The Long Bed Truck with the Short Bed Camper Shell, and Free Puppies. Frank Hamrick, Disclaimer: "The ... events occurred in Georgia, except for the final story, which took place in New Mexico. The characters' names have been changed to conceal their identities, except for my family members. The character 'Mom' actually is my mom. Even though that is not the name on her birth certificate; I suppose because my siblings and I did not yet exist. My dad is also my dad and my sister is my sister. The same goes for my grandmother. I also have a brother, who does not appear in this batch of stories. He has surfaced in my previous books. I am not sure how he will feel about not being in this one. He may be relieved." Ruston, Louisiana: Frank Hamrick, 2013. Edition of 25 + AP. 7.5 x 7.5"; 4 pocket pages. Paper made from cotton rag paper. Coptic stitch binding. Signed, numbered, and thumb printed. Frank Hamrick: "Pulp is inspired by record albums. 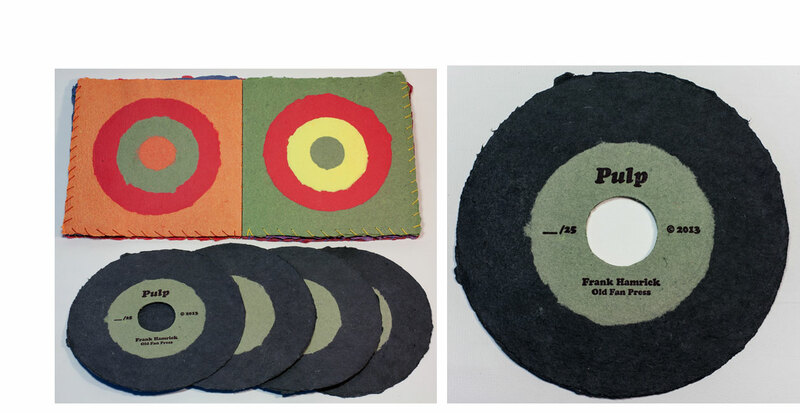 Pages in the book are sewn together to create pockets, each containing a 7" paper record. "Inserted into its sleeves are four paper records, three of which are signed and thumb printed, while the fourth is numbered. 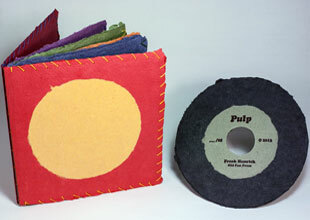 "Pulp is a hardbound Coptic, limited edition, handmade artists' book produced while teaching for the University of Georgia's study abroad program in Cortona, Italy." 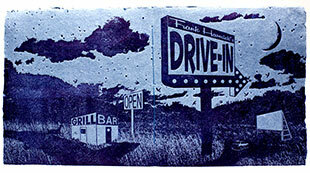 Ruston, Louisiana: Frank Hamrick, 2010. Edition of 25. 6.25 x 6.25"; 13 pages. Double-sided accordion structure attached to back pastedown. Mocha and gray Hahnemühle Bugra papers. Adobe Garamond Pro typeface. Paper stained by cooking it in tea. Quarter cloth binding over Davey binder boards. Frank Hamrick: "My first trip west led me across Texas and into New Mexico. The vast, open landscape surrounding Highway 90 was much different than the thick terrain of my native Georgia. Later abstract art reminded me of the open landscape I had seen in west Texas where the land and sky were reduced to large swathes of color when the day transitioned into night."